Footwear is probably the most important piece of kit that you’re going to invest in for hiking. 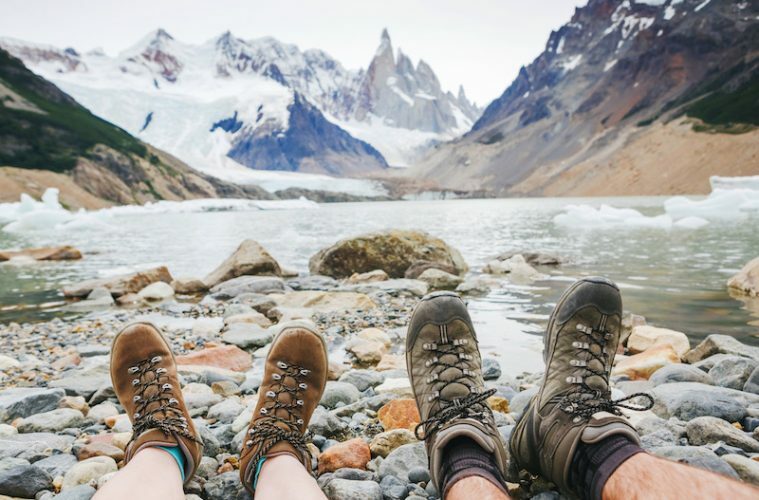 It’s probably one of the most expensive things you are going to invest in, too (apart from perhaps tents and waterproof jackets, which easily give boots a run for their money in this regard), so it pays to get it right. 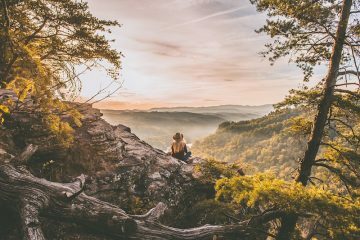 Luckily, we’re here to help and we have pulled together some of the best hiking boots for men (you can find the best women’s hiking boots here). Before getting into the nitty gritty, there are a few things we need to talk about. First of all, reviewing hiking boots is a tricky process. Everyone has feet of different shapes and sizes, so although we comment on how the fit feels to us, this is going to be something that changes from person to person. It goes without saying then, that it is essential to try boots on before buying. Of course, people also buy hiking boots for different reasons. 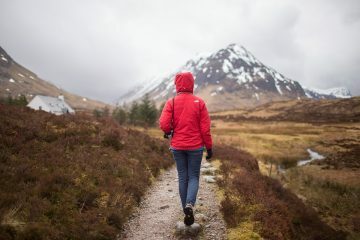 While one person might intend to climb to the summit of Britain’s highest mountains or trek in the Himalayas (and thus need decent support on the ankle and underfoot), another might spend their time walking in the countryside and on coastal paths (preferring the comfort of a low ankle cuff and good flexibility). Different boots will suit different people, but they all need to offer good grip, keep the elements at bay, be comfortable, offer the right amount of support and a good amount of protection against rough terrain. Oh, and if they’re not heavy or clumpy, don’t cost the world and look good, even better. So, to help inform your choice, here are 12 of the best hiking boots for men on the market right now. Put quite simply, the Zamberlan Fell Lite GTX is a beautiful boot. It has a smooth, leather upper that contributes to its classic styling, yet it only weighs 1,281g per pair (size 11), which is substantially lighter than any other leather men’s boot on test. As a result, it feels quite nimble and, combined with the narrow profile, doesn’t feel clumpy at all when worn. On that last point, it’s worth noting that the cut is slightly narrower than some of the other boots on test (it is an Italian brand after all), so there’s a chance your feet may feel a little cramped. Apart from this, they’re comfortable boots on the whole. It’s easy to get a really secure fit and, while the tread on the Vibram outsole isn’t quite as aggressive as some of the other boots on test, they did a good job in most types of terrain. One thing that surprised me was that the boots were so flexible, as normally leather boots are quite rigid. With this in mind, I wouldn’t recommend them if you plan to carry heavy loads or tackle the most rocky/rugged of terrain. There’s not much in the way of a rand or bumper at the toe or heel either, so protection isn’t the greatest from rocks and debris. In a line: The Zamberlan Fell Lite GTX is a beautiful piece of craftsmanship. American brand Oboz has been around for roughly 10 years, but has only started making moves in the UK in recent times. 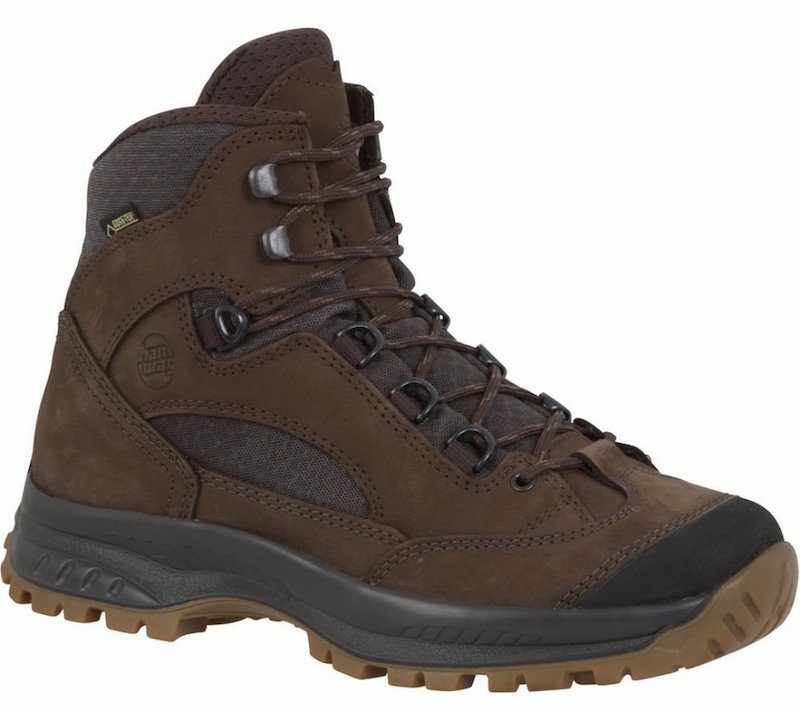 For this test, the company submitted the Bridger Mid Waterproof boot. Our all-black option looked sleek, and despite a low weight of just 1,299g per pair (size 11) is surprisingly rugged. The upper is constructed from nubuck leather and there are large rubber sections at the toe and heel that offer a great amount of protection from rocky terrain, while the Oboz B-DRY waterproof membrane ensured that our feet stayed dry. 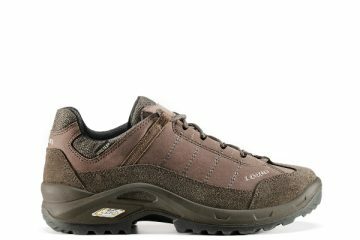 The outsole seemed to cope well with maintained or rocky trails, but on wet mud or grass it wasn’t quite on par with some of the boots with more aggressive tread. This was particularly the case on descents, where the rounded heel didn’t offer quite as much purchase as we might have liked. The Bridger offered a good amount of lateral rigidness, so we felt quite stable on uneven ground, but it still retained enough flexibility lengthways to ensure it was comfortable. The ankle doesn’t rise quite as high as others, so I’d be cautious about covering boggy ground. We also love that for every pair of shoes or boots bought, a tree is planted thanks to the brand’s partnership with charity Trees for the Future. How cool is that? 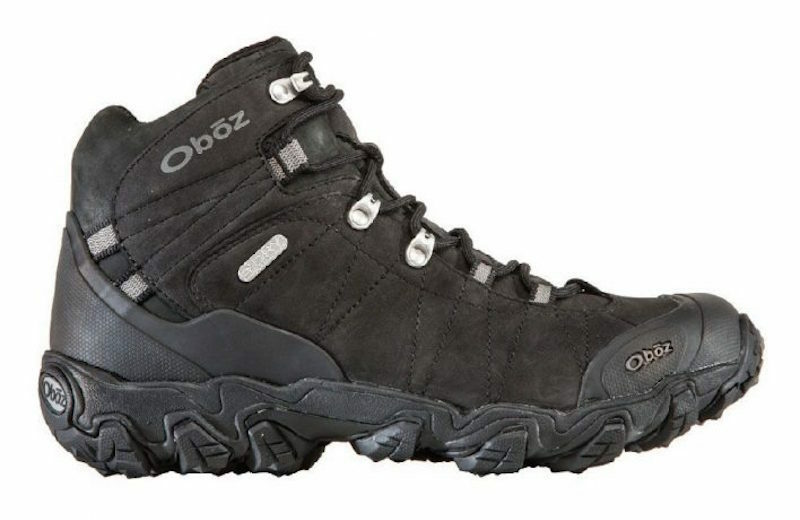 In a line: The Oboz Bridger Mid Waterproof is a good all-rounder for all but the most uneven terrain. Best budget buy. 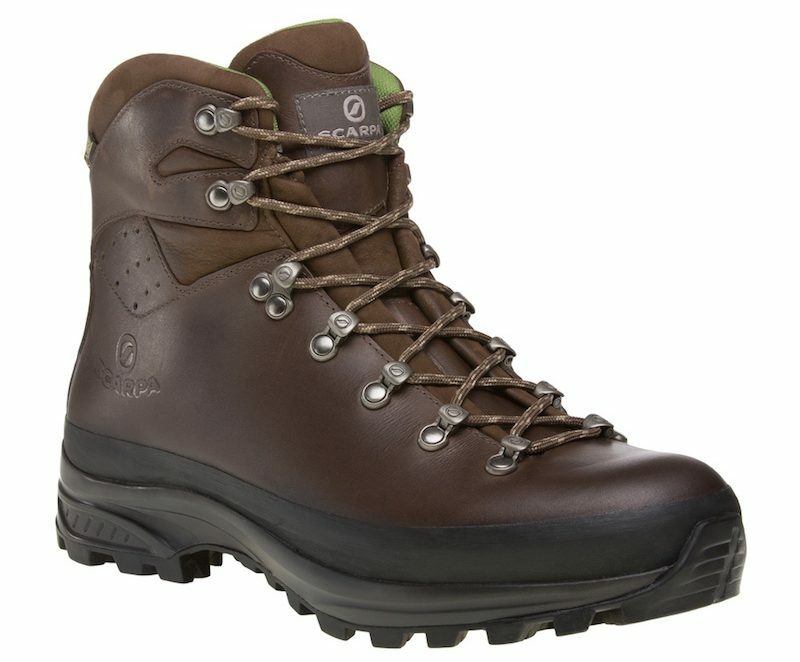 The Arrowood Riva Mid WP is billed as a tough, technical boot for the most rugged of terrain. But, does it live up to its billing? Well, let me first say that the boots are comfortable and it’s easy to achieve a good fit as the lacing system and padded tongue lock the boot into place very well. The fullgrain leather is supple and malleable too, adding to the comfort. They’re also lightweight, too, weighing just 1,196g per pair (size 11), helping you feel very light and agile on your feet. The ankle cuff isn’t the highest, so they do lack a little bit of support on uneven or boggy ground. Having said that, they do fit very accurately on the ankle, which mitigates this slightly. Unfortunately, the Arrowood Riva Mid boots didn’t overly impress us when it came to weather protection. Waterproofing is provided in the way of an eVent lining, but we did find that our feet became damp after a period of rain and walking through standing water. While the Vibram outsole performed well on solid, rocky trails, we did feel it lacked a little bit in slippery grass and mud. With the Arrowood Riva Mid boots’ flexibility in mind, as well as the above, we’d recommend these boots for dry hikes on maintained trails. If you fancy going off piste, you may want to look elsewhere. In a line: The Teva Arrowood Riva Mid boots are lightweight, comfortable and best suited to groomed tracks in dry conditions. I really enjoyed testing the Danner Mountain 600 boots. Style-wise, I think they’re probably my favourite of the bunch, and I probably wore them to the pub just as much as I did on the hills. But did they perform as well as they looked? Well, for a start they are incredibly comfortable. Even straight out of the box they fit perfectly and I was happily exploring without needing to wear them in. It was easy to achieve a good fit with the lacing system, but at times it was a little frustrating as the laces wouldn’t stay put in the top eyelets while being tied. With comfort and a good fit came a surefootedness that made these boots a pleasure to wear. At just 1,210g per pair (size 11), they’re lightweight, too. On well-maintained tracks they performed admirably, but they struggled a bit in particularly muddy or wet conditions due to the shallow lugs on the sole. They’re also not the most rugged of boots, with minimal protection coming from a small toe bumper and the outsole rising an inch up the boots on the sides. With that in mind, and the flexibility of the midsole, the Mountain 600 boots aren’t necessarily the ideal partner for scrambling or rugged, uneven tracks. They will, however, carry you across maintained tracks in comfort and style. In a line: The Danner Mountain 600 is a comfortable and stylish boot that performs best on well-groomed trails. 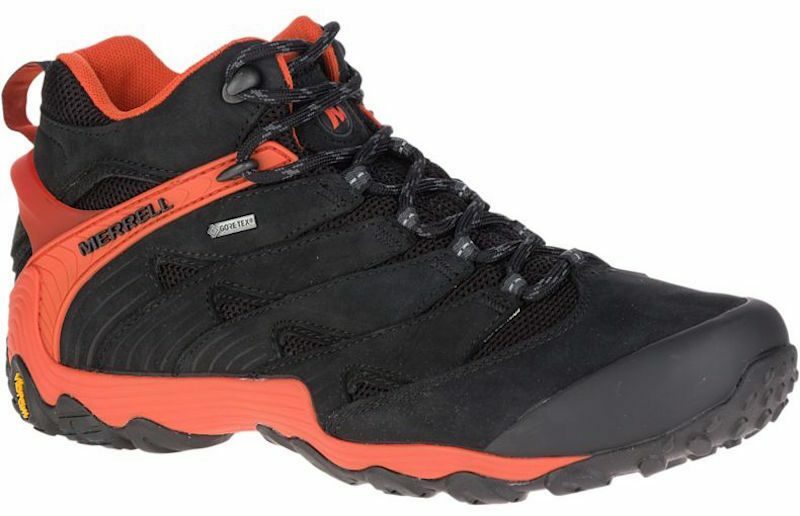 Merrell‘s Chameleon range of hiking boots has been around for quite some time now, and has been very popular among the outdoor fraternity at various points. The Chameleon 7 Mid is the latest boot to come out of the range and has been completely revamped. In testing, they were comfortable, agile and extremely lightweight. At 1,153g per pair (size 11), they are the lightest men’s boots on test, and they’re so lightweight that it feels as if you are just wearing trainers. Part of this is down to the new Vibram TC5+ outsole, which cuts weight with its pod grip design. While we appreciate the low weight, we did find the boots were fairly slippery in wet conditions. In the dry, however, they excelled. The ankle is fairly low, so there’s a worry about twisting your ankle if you’re on really uneven or boggy ground. The boot is flexible at the forefoot, which adds to the comfort, but retains a certain amount of lateral stability, which is good to see. In wet conditions, the boots didn’t perform quite as well as I had hoped and I did end up with slightly damp feet. 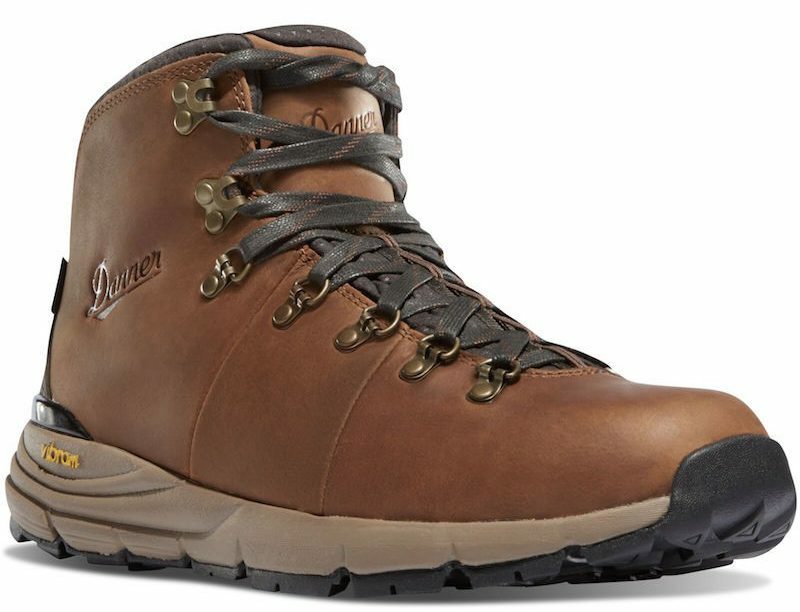 With the above in mind, I’d recommend these boots for summer day hikes and microadventures, but for anything in poor weather on challenging terrain you may want to look elsewhere. In a line: The Merrell Chameleon 7 Mid Gore-Tex is a lightweight boot that is worth considering for microadventures in good weather. The Renegade GTX Mid is Lowa’s bestselling style, and it’s easy to see why. First up, let me just say these are incredibly comfortable. Straight out of the box my feet were happy in these boots and the levels of comfort were on par with trainers. The boots also hit a good trade off between comfort, weight and support. The ankle raises relatively high (but not so much that it feels uncomfortable) offering reassurance on uneven ground. The Vibram Evo sole isn’t quite as aggressive as some of the others on the test, but it does a reasonable job in wet conditions and performs well in the dry. The Gore-Tex membrane also does it’s job well, keeping our feet protected from the elements, and the boots dried pretty quickly, too. While they could certainly handle some light scrambling, others are better suited, as the Renegade GTX Mid boots don’t offer huge levels of protection. The toe bumper isn’t that substantial, but the Monowrap construction helps stabilise the foot and offers good protection on the sides. As a final observation, I’d say that due to the comfort and relatively lightweight of the boots (1,341g per pair, size 11), they are incredibly nimble and you have a real confidence when moving across ground quickly. 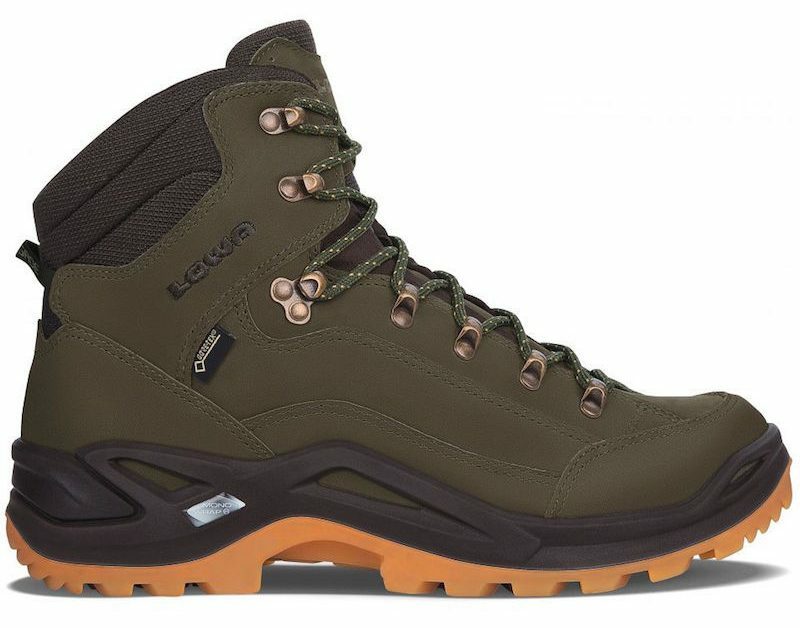 In a line: The Lowa Renegade GTX Mid boots are great value and do a valiant job in all but the most rugged of conditions. Whenever I’ve managed to get my hands on some Hanwag footwear, I’ve generally been very impressed, and the Banks II GTX hasn’t changed my opinion. The upper of the boot is made of a combination of quality nubuck leather and durable Cordura. This, combined with a substantial toe bumper and a moderate rand meant the boot offered very good levels of protection. The thing I particularly liked about the Banks II GTX is that, as well as the protection, the boot offers the support of a high ankle and just the right amount of flexibility and lateral stiffness to make it hit the sweet spot in terms of comfort and stability. At 1,424g per pair (size 11) they’re pretty lightweight for such substantial boots and I found them incredibly comfortable. My version was slightly too narrow toward the front, but Hanwag offers varying widths, so you should find a fit that suits you. I also found the Vibram Endurance sole performed very well. It gave me confidence in slippery conditions and seemed to rid itself of mud without fuss. The laces and padded tongue lock in feet extremely well, while the tongue bellows and Gore-Tex lining ensure the elements are kept at bay. 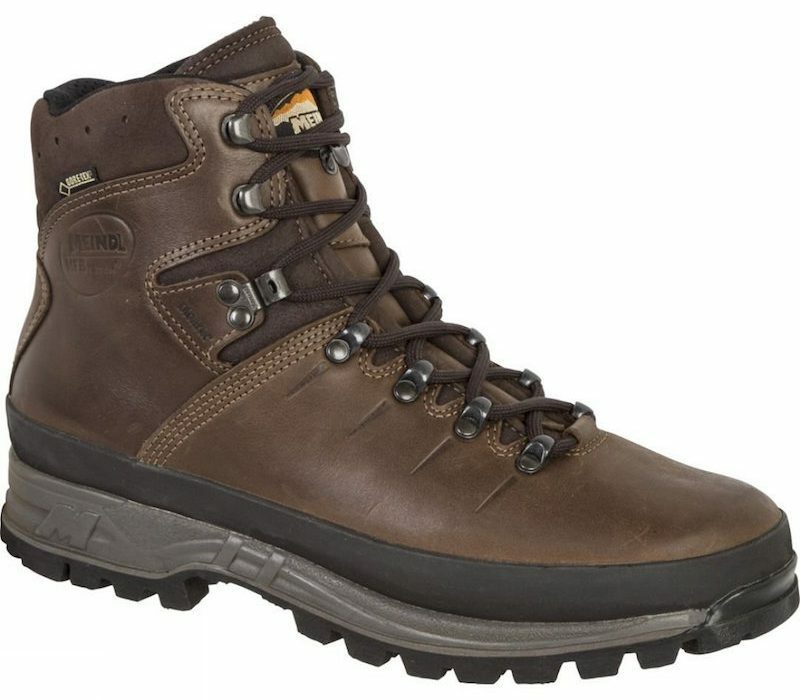 At £175, the Banks II GTX represents very good value, too, and have to be one of the best hiking boots on test. In a line: The Hanwag Banks II GTX is a solid, comfortable boot that is great on all kinds of trails. Highly recommended. 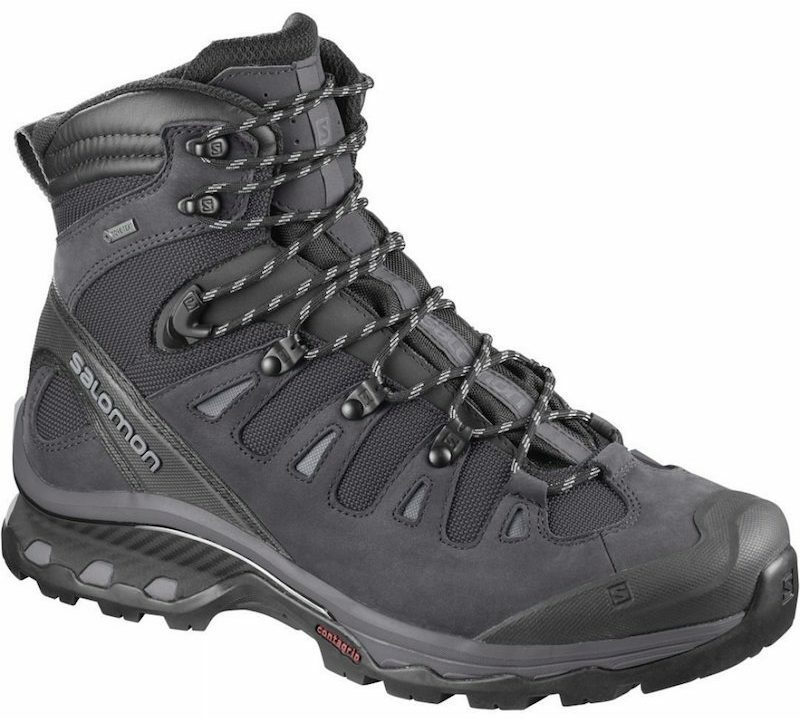 Salomon’s Quest 4D line of boots has been around for a little while now and such is its popularity that you are likely to see a pair on someone’s feet on most weekends out walking. With a high cut ankle, the Quest 4D 3 GTX offers a good amount of protection against twisted ankles, and a substantial toe bumper stands up well to knocks and scrapes. The 4D Chassis design offers a good level of stability for uneven ground and heavy loads, but there’s just enough flex at the forefront so that your range of movement is unhindered. One thing we did particularly like is how tiny little teeth on the eyelets lock in the laces, but we did find at the top of the ankle they came loose fairly easily. The contragrip tread is aggressive and performs well in a range of conditions, including in wet mud and grass. They stayed dry through downpours and stream crossings and, at 1,431g per pair (size 11), they’re relatively lightweight, too, which helps you stay quite nimble on your feet. If you’re looking for something that can tackle both scrambles in Snowdonia and coastal walks in Cornwall, but would rather fabric over leather, this is a very feasible option. The only thing holding it back for me was that it just wasn’t as comfortable as a couple of the other fabric boots on test. In a line: If you want a fabric boot that’ll handle the rough stuff, the Salomon Quest 4D 3 GTX is a great option. The Trango TRK GTX boots from La Sportiva are striking, to say the least. Our version came in a black/yellow colourway that will certainly ensure you stand out in the hills (which may or may not be a good thing, depending on who you are). The upper is constructed from a combination of abrasion resistant fabric and Thermo Tech TPU. At 1,419g per pair (size 11) they’re reasonably lightweight, and despite being considerably high on the ankle and featuring good protection in the form of the rand and toe bumper, it’s easy to forget they’re even on your feet. Having said that, they still feel pretty solid and I was happy with the amount of protection on offer. The 3D Flex System at the heel provides a good fit, and I found the boot locked my foot in well. Overall they were very comfortable, and offered the right blend of forefoot flex and lateral rigidity. The Vibram sole performed well on a variety of terrain and the deep lugs were great when things got muddy. They stood up to all weather conditions particularly well, helped out by the high tongue bellows. 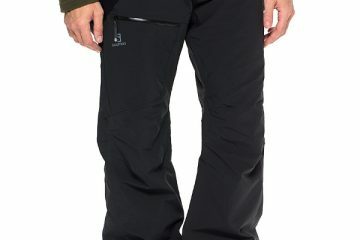 I found the high ankle offered good stability on uneven ground and I’d be more than happy wearing them in any conditions in the UK’s mountains. 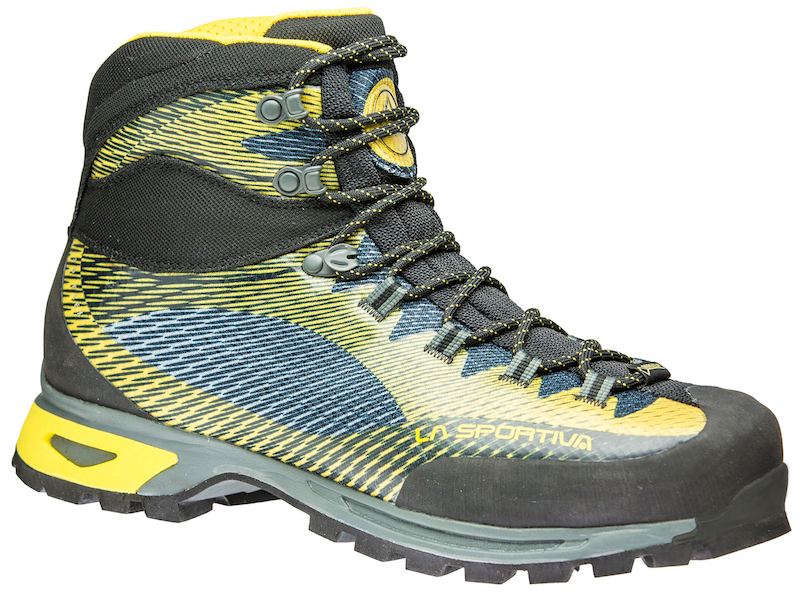 In a line: The La Sportiva Trango TRK GTX are great boots that will take you to Britain’s highest summits in comfort. They also happen to be the best hiking boots in test. Meindl has been a popular choice of footwear at Adventure Travel HQ for some years now, and it shows no sign of changing as we review the Bhutan MFS boots. In many ways, the Bhutan MFS is an all-mountain boot suited to everything the ridges and craggy summits of Great Britain can throw at it. The upper is constructed of top-quality leather, while the Vibram sole has deep, well-placed lugs that provide ample grip in varied terrain. 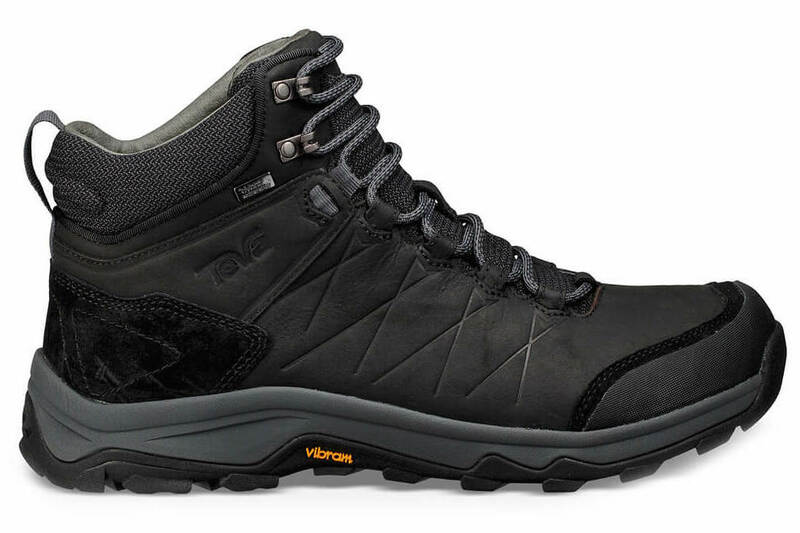 The Bhutan MFS offers a great level of support, with a high ankle and a stiff midsole that offers excellent stability on loose or uneven terrain. Having said that, there is enough flexibility in the forefoot for the walking to be comfortable. I found the fit was spot on, and the memory foam around the ankle helped make these a pleasure to wear. At 1,741g per pair (size 11) these are the heaviest boots on test, but they don’t feel like it when you’re wearing them and they remain quite nimble. 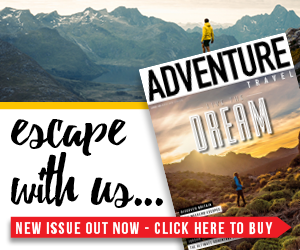 If you’re doing lots of miles, carrying heavy luggage or tackling the rugged terrain in the mountains (or anything else for that matter) they’re an ideal option, with plenty of protection on offer. Yes, they’re expensive at £200, but think of it as an investment and you will soon realise they’re worth every penny. 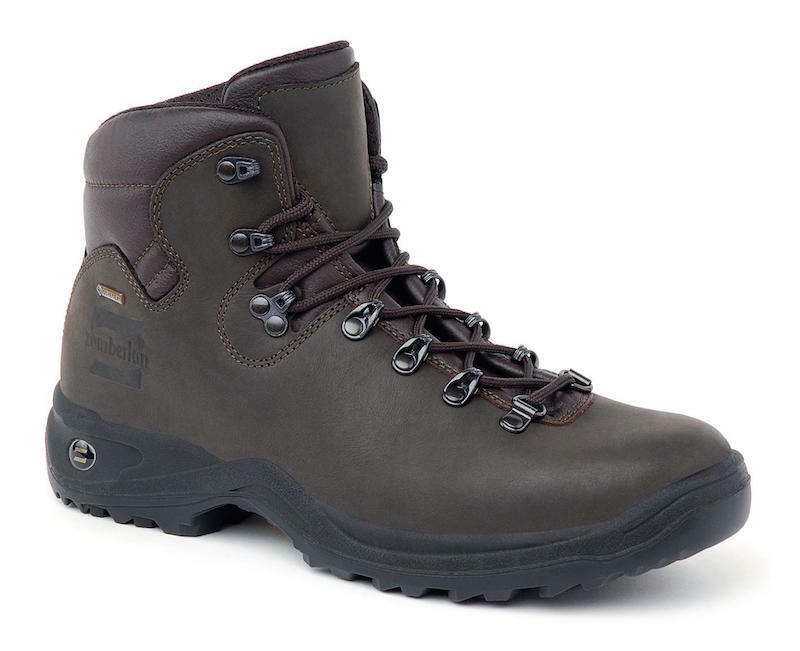 In a line: The Meindl Bhutan MFS is a fantastic boot that should answer all of your needs. 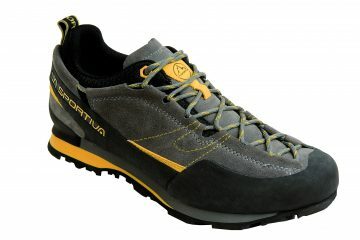 Interestingly, the Scarpa Trek GTX look pretty similar to the Meindl Bhutans, and they cost exactly the same too. Essentially, the Trek GTX is a classic leather mountain boot in every sense of the phrase. A Vibram sole with aggressive lugs does a great job of keeping you upright in all conditions, while a Gore-Tex membrane combines with the full leather upper to do a cracking job of keeping the wet stuff out. A rubber rand runs the full way around the boot to help protect against bumps and scrapes, while a high ankle helps fend off the risk of twisting an ankle. The fit of the Trek GTX is slightly narrower on the heel and mid-foot, but there is ample room in the toe box. All in all, I found it to be a very secure fit, with the lacing system doing its job very well. As well as the high ankle, stability comes from a stiff midsole that gives you confidence on uneven ground. In my experience, the Trek GTX will handle pretty much anything you throw at it. Scrambling and scree slopes pose no problem, while slippery, muddy slopes are tackled with aplomb. At 1,679g per pair (size 11), the boots don’t feel heavy or clumpy on your feet, making them a pleasure to wear. They look good, perform well and while £200 might sound expensive, it’s true when they say you get what you pay for… these are among the best hiking boots on test. 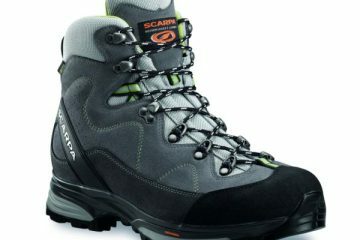 In a line: The Scarpa Trek GTX boots will see you well looked after in rough and rugged terrain. 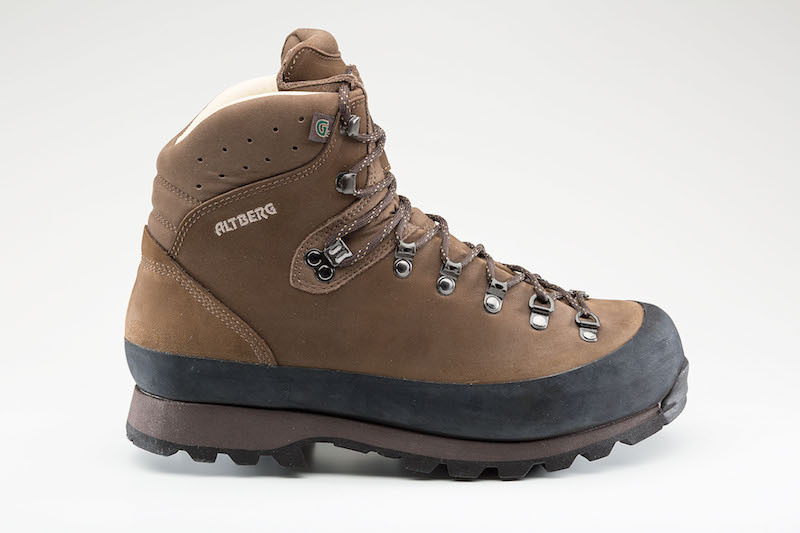 For the past year or so the Altberg Nordkapp boot has been my go-to option when heading into high, rugged ground. In my time spent with the boots I found them to be almost bombproof (one of the eyelets bent in recently), and they were certainly among the best hiking boots I tested. They weren’t the lightest, nor the softest underfoot, but they handled everything I threw at them. My experience with the Kidson panned out in a similar vein. It’s the second heaviest boot on the men’s side of this group test at 1,695g per pair (size 11) but it feels incredibly solid and seemed to cope with everything I threw at it. The deep lugs on the Vibram sole offer great grip on a range of terrain and the boots are particularly rigid, so in mountain environments they hold up pretty well. They did their job in all weathers and the substantial rand and toe bumper ensured my feet were well protected at all times. The stiffness, firm nature and weight of these boots meant they weren’t the most comfortable on test, but after a period of wearing in you soon warm to them, and an insole should help considerably. In the summer, your feet can get quite hot, and they’re probably overkill for lower level excursions. They do feel a bit cumbersome at times, too, but you can rest assured that they’ll take care of you. In a line: The Altberg Kidson is a solid leather boot that will take a beating, and then some.